Once a privileged royal child, raised by a lovingmother, Jorg Ancrath has become the Prince of Thorns, a charming, immoral boyleading a grim band of outlaws in a series of raids and atrocities. The worldis in chaos: violence is rife, nightmares everywhere. Jorg’s bleak past has sethim beyond fear of any man, living or dead, but there is still one thing thatputs a chill in him. Returning to his father’s castle Jorg must confronthorrors from his childhood and carve himself a future with all hands turnedagainst him. Prince of Thorns is the first volume in apowerful new epic fantasy trilogy, original, absorbing and challenging. MarkLawrence’s debut novel tells a tale of blood and treachery, magic andbrotherhood and paints a compelling and brutal, sometimes beautiful, picture ofan exceptional boy on his journey toward manhood and the throne. Ihave, for quite some time, put off reviewing this book. Why? Because I have aserious personal issue with it that got in the way of my ability to believe inany of the events that were taking place. Before I actually continue with myreview, let me get my grievance off my chest. Iseriously cannot, in any way shape or form, believe that the main character isa teenager. Sorry. I just can’t buy that one and my inability to believe in thecharacter’s age seeped into every single aspect of this book. Now, if he was inhis twenties, I’d probably believe it, but a fourteen-year-old thinking withsuch uncanny military strategy that him and his tiny band of rough boys canovercome a nobleman’s army (toward the beginning of the book) isn’t believable.I just don’t buy it. I don’t care how hard this kid’s life has been and howfast he’s had to grow up, a teenage boy just doesn’t make sense in the leadcharacter’s role. The maturity and life experience isn’t there. Okay,now that my rant is over, let me actually review Prince of Thorns. Itseems like gritty fantasy is the in thing right now and that really works inthis book’s favor. It is gritty and there is plenty of blood but I don’t thinkit’s quite as edgy as many people have made it out to be. The shock factor hereis that the lead character, Jorg, is a teenager and that is, perhaps, whatmakes this book seem a bit more gritty and edgy than it really is. The otherthing working for Prince of Thorns isit’s short length coupled with a fast moving plot. A dedicated reader can plowthrough this book fairly quickly. 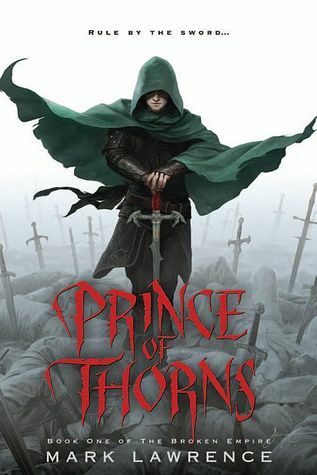 Prince of Thorns is told in the firstperson perspective with chapters that focus on “current” events and flashbackchapters that give a bit of a history and work toward explaining why Jorg isthe way he is. These flashback chapters help the reader build some sympathy forthis poor kid when you really wouldn’t expect to have any sympathy for him atall. Lawrence is a good author. There aren’t any major literary stumbles inthese pages. The writing is flowing and fairly descriptive. The one place itreally lacks is world building, which seemed pretty lackluster in comparisonwith some of his character development. However, this is a rather characterdriven novel, so it can be expected that the world building may take secondseat to character developments. Firstperson perspective is tricky for authors and readers. The author needs to makehis main character unique enough to pop in the context of his book. Thischaracter needs to have a remarkable individual voice to grab the reader’sattention. Personally, I feel as though many issues with first personperspective are largely individual. What may attract me to one character mayrepulse others. Please keep that in mind for what is about to follow. Jorgreally wasn’t an amazingly interesting character. In fact, I felt as thoughmany of the events that he was involved in were taking place more for a shockfactor than anything else and this did largely compensate for his rather boringnarrative voice. Without those shocking events, Jorg would have never been ableto stand on his own as a character. Theworld in Prince of Thrones wasanother disappointment. The idea Lawrence used has the potential to beincredible, but instead it felt half done, which was a huge letdown. With apost-apocalyptic world like this Lawrence could have done a lot to make itstand apart from the crowd, but the opportunity was missed. As it was, theworld has a rather unplanned feel to it and is colorless in comparison to manyof the characters. Prince of Thorns is an entertainingread, despite all of my qualms with it. It has been well received by manyreaders and reviewers, so there is something here that appeals to people. WhileI can see where many people would enjoy this, I couldn’t manage getting over myabsolute inability to believe in the main character due to his supposed age.His narrative voice is rather boring and is saved by the shock-factor ofmany of the events Jorg takes part in. In fact, I can, perhaps, sum up thisbook with the words “shock factor” because that’s what it felt like to me – aliterary campaign of Shock and Awe. In the end, Prince of Thorns left me thinking that Jorg was a puke teenager whoneeded a psychiatrist more than a book. However, for fans of gritty fantasy orpeople who want a quick read with a rather compelling story, this book is foryou. Despite my issues, I think Lawrence has an impressive future as an author and it will be interesting to see what he does next. It seemed to me like Prince of Thorns was two kinds of dark. (And the rest of this comment's gonna have SPOILERS, if anyone's not yet read the book.) The part that interested me was the more contemplative, all enveloping one, the way that every nation was under the thrall of other forces and all actions until the very end pointless. That I was fascinated by. But getting to that was damn hard, because the other kind of dark, the gritty, bloody, murderous fourteen year old kind, just wouldn't shut up and shove off. It felt to me like the book tried so hard to be dark and (as you said, shocking) that it ended up, just because of its own excess, lightening up the parts that actually were dark.